On August 3, 2016, Consul General Hong Lei met with Rick Snyder, Governor of the State of Michigan, who came to Chicago for the Annual Gala of China General Chamber of Commerce Chicago Chapter. Consul General Hong Lei spoke highly of Governor Snyder’s commitment in promoting Michigan-China relationship and his annual visit to China since assuming office. Consul General Hong Lei said that the development of Michigan-China economic and trade cooperation has been keeping a good momentum and the two sides also enjoy closer interactions in areas such as education, science, culture and people-to-people exchanges. In May, 2016, Member of the Political Bureau of the CPC Central Committee and CPC Secretary of Guangdong Province Hu Chunhua paid a successful visit to Michigan, which injected new impetus into the cooperation between Michigan and Guangdong. The Chinese Consulate General looks forward to making joint efforts with the Michigan State Government to push Michigan’s friendly cooperation with China to a new level. 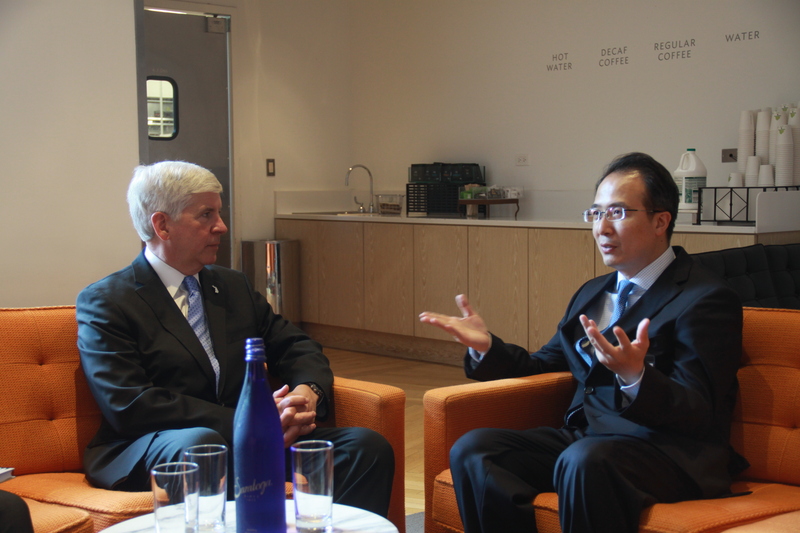 Governor Snyder said that he considers China an important partner of Michigan and he leads business delegation to China annually for the last several years in an effort to promote Michigan’s globalization drive. Enterprises headquartered in Michigan such as GM, Ford, Dow Chemical and Amway have huge investments in China and enjoy fast-growing businesses. Currently, Michigan is being reinvigorated with sound economic development and Detroit has become a comeback city. Business environment has been greatly improved and more and more Chinese companies have come and made investments, especially in the automotive industry. Michigan will conduct pragmatic cooperation with China in more extensive areas, which will benefit the people on both sides. Deputy Consul General Wang Yong, Liu Jun, Yu Peng,Commercial Counselor Zou Xiaoming and Director of Michigan-China Innovation Center Brian Connors were also present at the meeting.